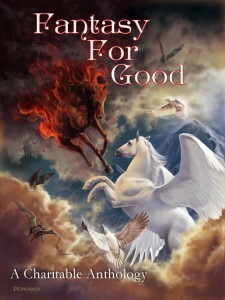 So in a moment I’m going to list a few ways you can help us get the word out about Fantasy For Good, which is available for Amazon pre-orders now. Thanks to all of our contributors for allowing us to publish your work. We had a blast putting it together. Now that we’re live on Amazon for pre-orders, we’re asking for your help to spread the word. A tweet, a Facebook or Google+ post, your blog, discussion groups, anywhere you go online. Here’s a handy dandy link you can use, which will direct your audience to the Amazon page for FFG in their own country. Yes that’s right, no more having to post multiple links for each nation’s Amazon site. Please be sure to mention the Colon Cancer Alliance, who have been extremely supportive of this venture from the start, and encourage people to get screened, unless you’re tweeting in which case you have barely enough room to sneeze. You can use the hashtag #fantasyforgood if you like. We have a listing on Goodreads, so please be sure to add the book to your Want To Read shelf. If you are a contributor to the anthology, please don’t forget to add the book to your Amazon bibliography via Author Central. This will add your picture to the “More About The Authors” section as well as including the book on your author listings. If you’re not sure how to do this, fantasyforgood at gmail.com and I’ll take you through it. And please follow me on Twitter, @chababug, for all the latest updates. Thanks for helping to spread the word, we truly appreciate it.